So, everything is still in motion for us to move very VERY soon! Oh, yes, the time is flying & it went from being 6 weeks away to being a week from tomorrow!!! How did that happen?! I don't know! All i know is, one minute i was moaning about how 6 weeks is going to take FOREVER, and now I'm...well, now I'm moaning that 2 weeks is going to take FOREVER. I can be dramatic & whiny. I'm not the most patient person on the planet. But really, it's HERE! It's practically here! Today was one of my favorite days having to do with house purchase, because it was not another day of hubby packing and me procrastinating... instead, it was a day of SHOPPING! This morning we skipped church & went to Mason's Grill for breakfast. (I know...heathens!) You may remember that Mason's is where we went for my (non)Mother's Day & it was AMAZING. We went today and got the same thing as last time (creatures of habit, i tell ya!). And it didn't disappoint. He really loves when i take pictures while he's eating. After breakfast, we headed out shopping for the new house! We had a very specific list in mind! First, we went to Target. Brad wanted some very basic cheapo shelves for his studio to put his books. His current shelves are fastened to the wall & they could be removed but they're a pain to move & he really doesn't want to try. I wanted to look at other house things in Target, not to buy anything but just to see what they have as far as TV stands, ottomans, & comforters. 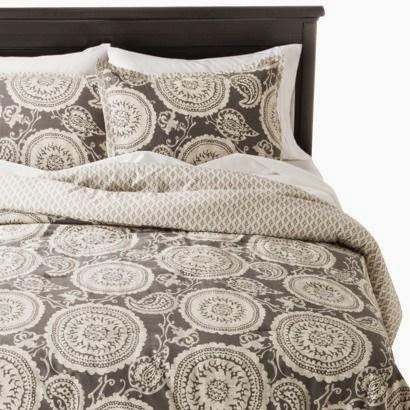 I saw a comforter online from Target that i really like and am considering, but i was hoping to see it in person. It wasn't in the store, though. I saw other cute ones but i think i may go back to this one. Yes, it is gray... did i mention i am already painting our living room & kitchen gray, and our couch would be gray?! With teal accents of course, but why am i now trying to make our bedroom gray?! Apparently i have a new obsession with that color. Weird. Anyway. Then i was on the Lowe's website & found a really pretty lavender/gray paint color called Sweet Orchid, and thought, heyyyy. orchid on the walls, gray on the bed, orchid accents.... not a bad plan! It's not for sure, but i do like it. Still undecided. After Target, we headed to Lowe's. We got a great deal on a refrigerator (thanks, Labor Day weekend sales! ), and we also bought 3 ceiling fans! Plus, we looked at paint & patio furniture (both of which can wait for a later date). I have never had so much fun in Lowe's...not even CLOSE! Today it was my favorite. After that we had lunch and we were so excited!! Brad happy that the shopping didn't take all day long, and me happy that i found a cute couch! And fridge & fan, of course, but mostly i was happy about the couch! So that's what is happening lately! Yay! 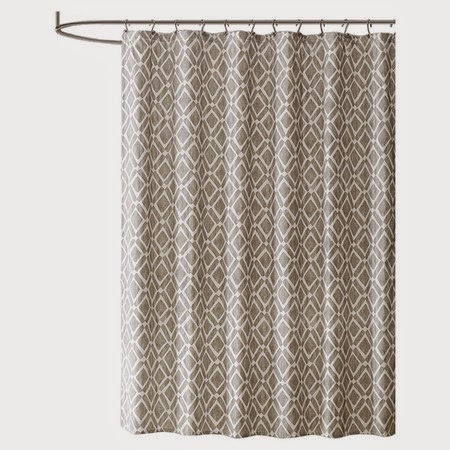 Oh, I did settle on a shower curtain for our bathroom. Gray. Go figure. I seriously have a problem. But i liked it too much! I guess my whole stinking house will be GRAY! Whatever. I'm just gonna go with it. One thing I am really excited about is two canvases I ordered from Canvas on Demand. I have always wanted canvases from some of our professional photo sessions but they are soooo expensive! Canvas on Demand regularly runs a special for 2 large canvases for $49. My friend ordered hers recently and they just came in and are VERY VERY NICE!! So when they ran the special again (which is NOW, FYI), i joined in! I'm super excited! LOVE the couch!! I'm loving all the gray! Can't wait to see your house!!! Nice work! Haha, you are obsessed, but it's a great color and those accent colors will make it all look gorgeous! I can't wait to see your decorating. We just did a epically huge DIY and went with a Purplish-grey in our bedroom. Although looking at it now it's definitely more purple than grey. Still came out good though! I love all the stuff you've picked out so far and can't wait to see it all in your new house! Great choices!!! Excited to see how it all turns out! I bought a house 6 months ago and decorating slowly, one room at a time. So far 3 rooms I did are gray (different shades of gray). I always loved bright colors, so there must be something in the air. LOVE all your picks. The underside of that comforter (the diamonds) are ADORABLE! And I gotta say, I love gray so I can't wait to see it all put together!